Message: We all have a story. Whether you know it or not, it is indeed a story worth sharing. Your story can touch someone in a way that will change their life for all eternity. It can be the catalyst in a domino effect for generations to come. All of our stories are different. Some are still being written. Some have long since passed on. The true beauty of our stories, however, is that they are all united into a single purpose. They all lead us to one place: the cross. Calvary. It is the place where Jesus shed His precious blood for us all. It does not matter how you got there. All that matters is that your life was changed. Forever. Your story, written so sweetly by the Lord especially for you, is tattooed on the cross, set in stone. That story, combined with countless more, has enormous power. Imagine this hypothetical situation … you have a neighbor who moves in across the street from you. You invite them to church, have lunch together following, and share your story. Your story inspires them to talk to a co-worker about the power of Jesus. A janitor overhears this conversation and decides to take his family to church for the first time. They attend a service. They love the community. They begin serving together. In an outreach downtown at a homeless shelter, they meet a young 16-year-old mother of an infant who is struggling. The girl, weeping and drained from life, admits she has given up hope on life. The family takes her in. She comes to Christ, raising her sweet daughter in the church. That daughter grows up to go become a missionary. Her mission takes her to Africa where she influences hundreds of lost souls. Your story being shared with one neighbor across the street has not just affected their life. Starting as a small snowball, it has multiplied into an avalanche of awesomeness, touching the lives of thousands. Is this example a bit extreme? Yeah, maybe. Is it possible? Without a doubt. “With God all things are possible” (Matthew 19:26). I had the privilege of attending an evangelism conference last Friday at Lenexa Baptist Church. For the small price of $15.00, I was blessed with two meals, seven amazing speakers, and plethora of wisdom, scripture, and inspiration to reach out to others in the name of Jesus Christ. The conference was put on by Steve Barnes and his amazing website, www.1millionstories.org. It made me rethink how I could be using my story to affect the lives of those around me. The website works like this. You take time to submit the story of how you came to be a Christian. The story gets approved, and it appears on the website. You can choose whether or not to include a personal photo. Your name will appear as first name and last initial. People can search your story by theme, share it, and use it to inspire others. Whoever you are, I would love to share my story with you: http://www.1millionstories.org/stories/337. This is the generic version of my testimony, the same version I share with the youth in my church and new acquaintances. The deeper more raw version is saved for close friends and family. Only they know specifically what I went through to finally come to Jesus. Long story short, I was reborn on February 9, 2013. Since that day God has been using me in extraordinary ways for His glory. At the conference Steve shared a beautiful story of how he used his testimony to touch the life of a young lady he met at a Phillips 66. It was later at night, and the transmission on his car went out. Exhausted, he pulled into the gas station and met the girl while waiting to get his car fixed. After a short conversation, he found a way to turn things to the spiritual side by offering to share his story with her. She received a business card from Steve out of his wallet leading her to his story on his own website. Steve did not hear from her for months, but that changed when she showed up at his church a few weeks ago. After all that time, she is now seeking the Lord and asking questions. All because he took the time to listen to her and show that he cared. None of this would have happened in the first place had his transmission not gone out. Talk about God working everything for our good! What about you? 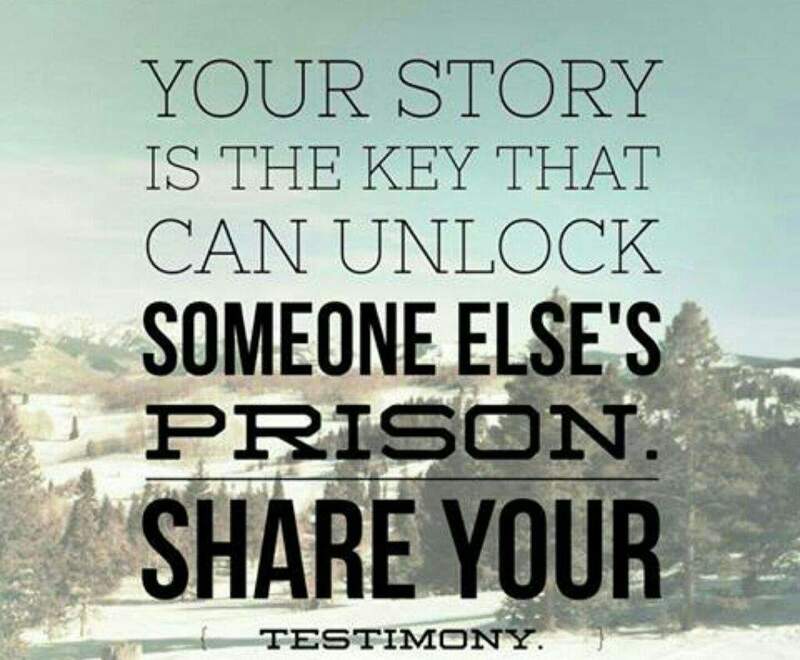 Who have you shared your story with? Do you practice your testimony enough to share it with a complete stranger? Do you have a two-minute version? A ten-minute version? How about a deeper, half hour version? “Has the LORD redeemed you? Then speak out! Tell others he has redeemed you from your enemies” (Psalm 107:2). Through your testimony, God has armed you with a powerful weapon to take down the enemy. Your story is unique, powerful, and it has the power to save someone’s life. Why not embrace it? Share it with a neighbor over coffee. Twist a conversation in a long line at the grocery store into an opportunity to show what God has done in your life. Scatter some seeds out there, and watch God take those seeds and grow them through His amazing power. Create a domino effect for eternity that will influence generations to come! Challenge: Get on the website www.1millionstories.org and submit your testimony about how you came to Jesus. Be proud of what He has done for you, and share your story with passion! Video application: Watch this video that I created for my Fellowship of Christian Athletes (FCA) group. It explains about how you can share your testimony and shares how I came to Christ as well. Use it to inspire how you can share your own story. Journal/Accountability: If you have never done so, journal about your story. Break it down into the three categories: your life before Christ, how you came to Christ, and what God is doing in your life now. Practice your testimony on a close friend and get feedback. Ask them to hold you accountable in sharing it freely. Bible story: Read the story of how Paul shares his testimony in Acts 22. How does Paul use his story to show what Christ did in his life? Even though he knew his story would most likely lead to persecution, why do you think Paul continued telling his story? What is the worst thing possible that could happen to you if you shared your story with someone? What impact could your story have on not just one person but many if you shared it the right way? Prayer: Father, I thank you for the power of all of our testimonies. May we use them to bring others to Christ with passion and enthusiasm. Amen.